Having been busier than usual recently I have not had the chance to post something in quite some time. However, as I sit here knowing it is Yom HaHashoah, I decided to make the time to write something. It’s the very least I can do on a day that sadly will always be important to the Jewish people. The story I will tell is one of zero tolerance, education, and a positive outcome. About a week and a half ago I was kidding around with a work friend regarding the impending NHL Ice Hockey playoff match up between the Philadelphia Flyers and New York Rangers. I have been a fan of the Flyers for a long time and I engaged in verbal battle with my work friend who is a long time fan of the Rangers. In the heat of our spirited, and to that point fun debate, he stood by my doorway and in conjunction with an insult towards the Flyers performed the Nazi salute. Let me say at this point that us Jews who care, generally know who is an anti-Semite and who is not an anti-Semite. I know with a great degree of certainty that the person I am speaking of is not an anti-Semite. However, as a Jew, and son of Holocaust survivors, I was presented with a situation in which my reaction would be important regardless of his intent. I stood up, walked forcefully towards the door and with a degree of harshness I save for true and intense anger said “Don’t ever do that sh*t in front of me again.” Somewhat taken aback by my tone and bad language the situation escalated slightly until we both chose to stay on opposite sides of the office. That night he called me, and with admirable humility apologized profusely and without excuse saying that he messed up and knew he was wrong. I accepted his apology immediately for a few reasons. The first one and most important one being that I knew even as it happened that this is not a person who condones hatred towards the Jewish people in any way shape or form. His actions were more those of an ignorance to the significantly offensive nature of the action. And as Jew it was incumbent on me to make sure he would know differently and subsequently never do something like that again. Something I am very confident is now the case. Another reason I accepted the apology immediately was that despite the seriousness to me as a Jew, the action was nothing more than an individual making a mistake, something we all do sometimes, which meant that once he realized it and apologized, I was comfortable putting the incident behind us. There is however one important point relating to this incident that I wish to emphasize. As Jews witnessing a worldwide resurgence in anti-Semitism not seen since the time of Nazi Germany, we must take extra care in showing zero tolerance for anti-Semitic action of any kind. 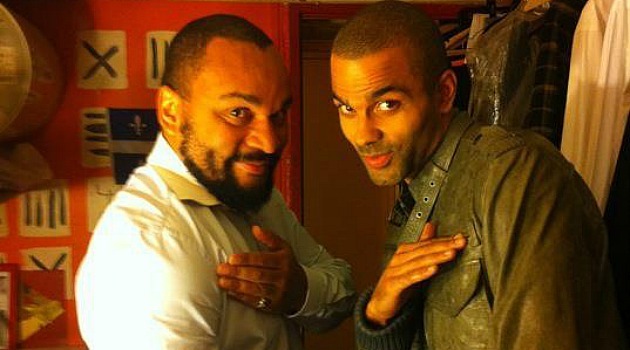 When Dieudonne M’bala M’bala, the French “comedian” who is proud of his anti-Semitism does the quenelle gesture, the reverse Nazi salute, he does so with no concern over how much he offends anyone, particularly anyone Jewish. As a result, no tolerance can be shown towards the action regardless of who does it and their claimed intent. Case in point NBA star Tony Parker. Tolerance and acceptance was something all to present in pre-Holocaust Europe and we all know where that lead. Can our zero tolerance ultimately make the difference between our death and survival in the future? No one knows the answer to that question. But we have no choice but to do everything we can to make a difference. We owe that to ourselves, the world, and the 6 million Jews we will always honor and remember.